For many homeowners, renovating the backyard is about much more than just keeping up with the Joneses or finally getting rid of some overgrown landscaping — it’s about increasing the amount of enjoyable living space and transforming what might otherwise be a mundane yard into a private retreat. That’s probably one reason why pergolas rank as one of the “top upgraded outdoor structures” — with more than a quarter of homeowners undertaking projects opting to update their pergolas (and of those, a quarter opt for a “major renovation” while 30% opt for an overhaul). With Vip3D, VizTerra, and Pool Studio, you can now create and customize the perfect pergolas, patio covers, and arbors for your clients — offering your clients not just a shady area but also an ideal gathering spot and a focal point in their outdoor living space. And it’s incredibly easy to do with fully integrated pergola design software. When your clients want a pergola to provide shade in their backyard, the intuitive new Pergola design tools give you the power to quickly transform their space. Complete with pergola templates and even new pergola designs, the software works seamlessly with you — helping to capture every important detail and reveal all of the beautiful finishes you’ve selected for your client. To create a custom pergola, simply draw out the shape you want to the desired dimensions in the Custom Shape and Pergola Stage. Because the software provides so many precise controls, it’s easy to design your pergola, patio cover, or arbor in any shape, in any location — including right against the client’s house. For example, if you want to create a pergola around your client’s home, you can use the Line and Outline tools, while following the existing hardscape. 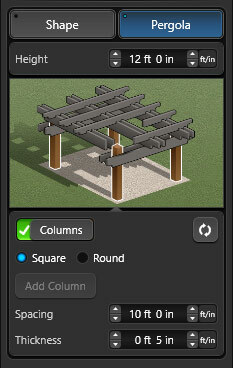 In this stage, you can switch back and forth between Custom Shape and Pergola at any time in 2D (just select the option you need in the panel). That makes it easy to customize even the most unique shapes to meet your client's needs. After you’ve drawn your desired shape, you can easily adjust its appearance in 3D. Simply double click on any given section. As you do, the panel menu will update with the options available for your selection. If you prefer, you can also use the panel menu to switch to the section you want to edit. For example, if you want to adjust the pergola’s height to match the roofline of the house, you can do that quickly in the panel menu. And if you change your mind, simply click the reset button to undo any manual changes to any layer. In a few simple clicks, you can refine your custom pergola to offer your client the results they want: just double left click on the slats on top to select them. Every detail is easy to adjust: the spacing, the thickness, the height. Even just how far the slats cut into the rafter is easy to adjust — just edit the inset. If you want slats with 1’ spacing, 2” thickness, and 2” height with no inset — you can adjust your design and then see the results instantly. 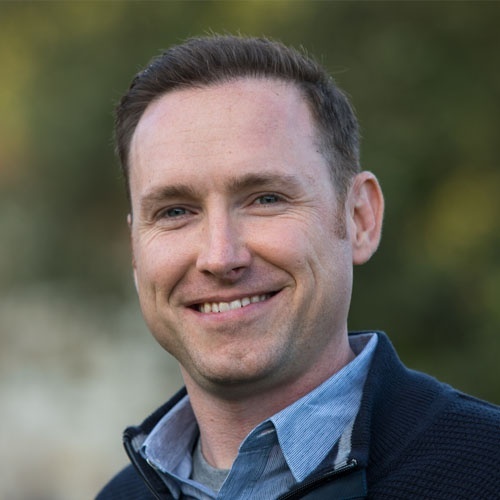 As you design, your changes are immediately updated in 3D. And if you need to add or remove a slat, simply select an individual slat to move or delete it — and then click Add Slat to add another one. 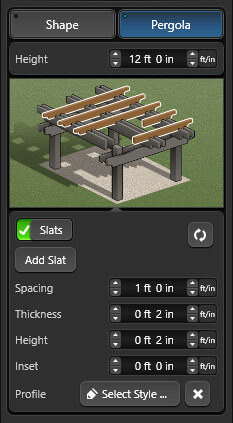 Or, if you’re building a pergola with just rafters and supports, you can turn the slats off in the panel menu. You can adjust the spacing, thickness, height, and inset of the rafters as easily as the slats. Add more rafters, rotate the framing, and use Move to adjust the position of the Rafters — you can quickly create the ideal arrangement to provide your clients with just the right amount of shade in their space. If you build your client’s pergola next to their house, you can turn on the House Ledgers option to add a ledger board along the house where the pergola attaches and provide added support. Whether you want square or round columns, closely spaced or distantly removed — you can adjust all of the details of your columns from the panel. Choose the shape, change the spacing, and edit the thickness. You can even add extra columns, and then move them as needed. One of the easiest ways to reveal a beautiful finished look to your client is to adjust the appearance of the boards. For each layer, there is one final setting. The profile setting allows you to adjust the end of the boards appearance. Simply select the layer, such as Rafters, and click the Profile option to open the Library. 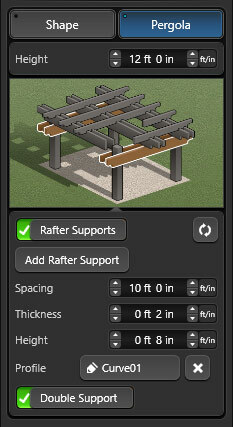 Once you select a layer (like Rafter Supports or Slats), simply double click to apply your chosen style. If you want to restore a flat end to the boards, simply click the X next to the Profile option. 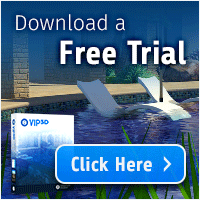 The integrated tools take advantage of all of the best features of your pool and landscape design software and extend those tools to give you powerful pergola design software, patio cover design software, and arbor design software in one easy-to-use package. That seamless integration means you can also create your own custom profiles, instantly. It’s easy to do: simply draw the profile you want in 2D, save it to the Board Profile category in the Library, and then apply your custom style to your structure in 3D. Any shape, any style: the pergolas, patio covers, and arbors your clients want are effortlessly easy to design and share in stunningly beautiful and precisely accurate 3D. Adding the perfect finishes touches is now easier than ever, whether you’re opting for a new wood finish, a new fill pattern, or even a new line style. Any part of the pergola can feature a unique material — simply select the part of the pergola that you want to adjust. Within the Wood category of the Materials Stage, you can select from an extensive variety of beautiful options to apply to each and every section of your pergola. When you want to adjust the Rafters, Rafter Supports, and Columns, you can see options in Construction Markup, where you can also adjust the line style and fill pattern for the overall structure. And to make things even easier: the software will remember your choices and automatically apply them, speeding up the design of your next pergola. Ready to design a custom pergola? When you create a custom pergola, patio cover, or arbor with fully integrated patio design software, it’s incredibly easy to add all of the special features and finishes your clients love — while also using the precise controls to make sure your design is exactly right. Plus, when you design your signature pergola, it’s easy to save your design to your library — ready for another custom project. If you have any questions, leave a comment, give us a call at 800-778-8996, or send us an email at support@structurestudios.com. We’d love to see the custom pergolas that you create!